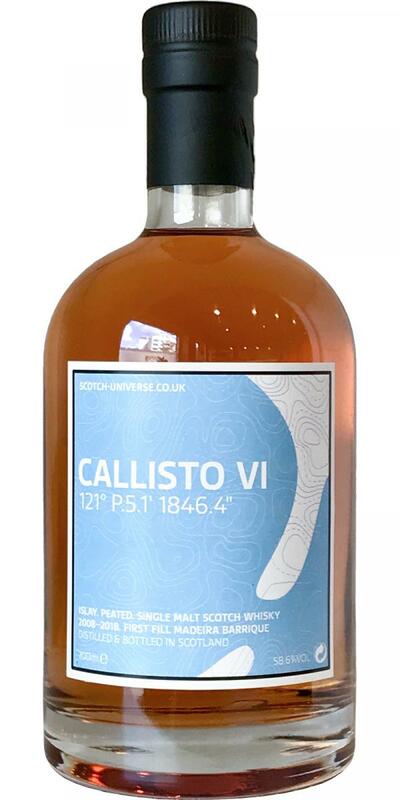 Scotch Universe Callisto VI - 121° P.5.1' 1846.4"
Whisky Reviews for Scotch Universe Callisto VI - 121° P.5.1' 1846.4"
For me a really great varied Islay whisky with rough edges. As soon as the bottle is opened, a nice smoke rises, then comes clear sweetness, fruits like berries and somehow it seems very dark. Of course he has alcohol and can hide this little. So let glass just stand a little, then it comes to rest clearly and releases other flavors. After a while you will get spices, salt, maritime notes and earthy aromas. Every now and then something fleshy, mineral comes through. Something is already happening in the nose and the sweetness is always coming forward. As soon as you have the Callisto VI in the mouth it is already very intense, it takes the entire palate and then gets really warm, seems to be the effect of almost 60%. He just can not and does not want to hide it. Great is the combination of incredible sweetness of Madeira paired with the really intense dark and earthy smoke. The Callisto VI always stays fruity and maritime and salty. Leather is to taste and always a mineral - kräutrigen impression but also an oily, dirty character he can exhibit. If you take some water to help me with a droplet, it will make us somehow sweeter and more fruity. The basic character of a wild Islay whisky remains. Personally I really like the station wagon Madeira & smoke very well. For me a perfect storage in such a barrel, because the wood appears beautiful, but is not too dry and spicy.